Now that it’s January, it’s time for me to give up some of my holiday excesses. These would include dozens of Christmas cookies consumed, far too many glasses of champagne drunk, and more imported cheeses than I’m willing to admit to. However, there is one thing I got hooked on during December that I refuse to give up: made-for-TV movies. The Hallmark Channel reeled me in, with their dozens of original Christmas movies featuring C-list actors, impossibly fake snow, and hilariously bad dialogue. By the time Dec. 25th rolled around, I was in a haze of trashy holiday cheer. Now that it’s January, I may be willing to part with the Christmas sentimentality, but not the so-bad-it’s-good entertainment. Therefore all this month on Cinema Sips, I’ll be highlighting my favorite made-for-TV movies. If you have any favorites, be sure to leave a comment- I’m curious to know if there are any other readers who occasionally go to the dark side…..
To kick things off, I advise cancelling all plans for the upcoming weekend in order to properly settle in with the Anne of Green Gables trilogy (DVD). This will include watching Anne of Green Gables, Anne of Avonlea, and if you can stomach seeing Gilbert Blythe with greying hair and wrinkles, Anne of Green Gables: The Continuing Story. If that’s too much for you, just the first one will suffice, but I personally find it impossible to watch just one. This Canadian mini-series was based on one of my favorite childhood book series by Lucy Maud Montgomery. How lucky for us Americans that PBS started airing it any time they did a pledge drive in the early 1990’s. Megan Follows is perfect as Anne Shirley, the plucky orphan who loves literature, poetry, and writing, and who was basically my teenage idol before Angela Chase came on the scene. And there are no words to describe my undying crush on her love interest Gilbert Blythe. I still attribute my 5-year period as a redhead on a secret wish to be called “carrots”. My cocktail this week is based on the great scene where Anne accidentally gets her bosom friend Diana drunk (no, this is not some weird Canadian lesbian term- get your mind out of the gutter). What they think is raspberry cordial is actually currant wine, and Diana has three tumblers of it before barfing in the rose bushes. Currant wine sounds a bit god-awful, but I do like the sound of raspberries. This week, I’m using some leftover champagne and a tasty bottle of flavored vodka to make this Sparkling Raspberry Elixir. Mix vodka, lemon juice, and simple syrup in a shaker over ice. Shake until chilled, then strain into a martini glass or champagne flute. Top with Prosecco and garnish with fresh raspberries. Watching this movie again is like seeing an old friend. When I was younger, it was such a comfort to me that there was someone else out there (fictional or no) who enjoyed using her imagination as much as I did. Green Gables always seemed like such a magical place, filled with flowering orchards, wooden rowboats, puffed sleeves, horse drawn carriages, and poetry. But really, Anne was the one who made it magical- turning a simple pond into the “Lake of Shining Waters”, a petal-strewn road into the “White Way of Delight”, and a red-headed orphan girl into a kindred spirit for all of us dreamers. Cheers! 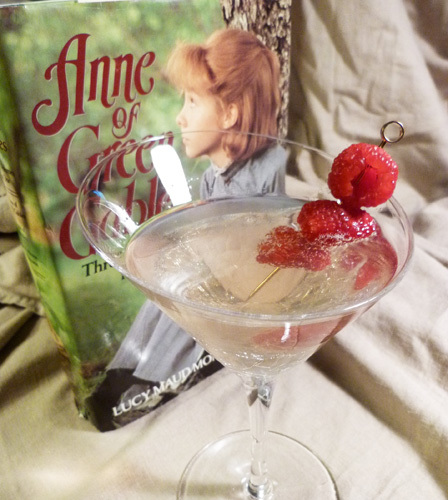 Posted in TV Movies and tagged Anne of Green Gables, Anne of Green Gables Cocktail, Anne Shirley, Gilbert Blythe, Lucy Maud Montgomery, made for tv movies, Megan Follows, Sparkling raspberry cocktail. Bookmark the permalink.